Boulder Primary School has a strong history of sporting achievement. We consistently ‘punch above our weight’ during Goldfields sporting activities. Our Football Academy has been running since 2017. Students in Years 4, 5 and 6 are invited to apply, and successful applicants train with the Clontarf Academy teachers and students from the High School. Students in the Academy agree to uphold high standards for themselves around behaviour, respect and attendance. We thank Wilmot Engineering for their continued sponsorship of the program. 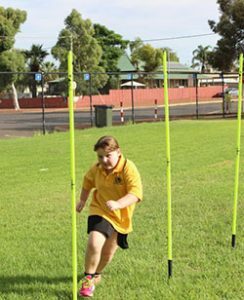 The Football Academy plays in the EGSSA Winter Football competition, as well as against O’Connor PS for the Danny Ogilvie Challenge. Danny was an AIEO at O’Connor PS as well as an officer at the prison, and he helped many O’Connor and Boulder families along the journey. 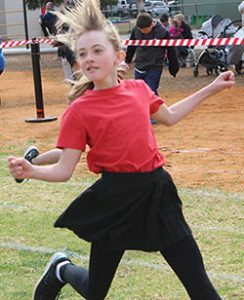 Boulder Primary School students participate in a range of sporting activities. The highlight of the sporting calendar is the Faction Carnival, which has taken many forms throughout the years. The factions are Trafalgar (red), Fimiston (green), Lakewood (blue) and Kanowna (gold) after small townships which used to be in the surrounding area, some of which had small schools who would have competed against the earlier pupils at sporting carnivals. Since records have become available, a fierce rivalry between the factions has been developed. Fimiston won the first recorded carnival in 1959, and have taken out 18 carnivals. Trafalgar, helped by a run of five successive titles in the 2010’s, has won 16 carnivals. Lakewood has been very consistent, winning in each decade to take out 14 carnivals. Kanowna has won 7 carnivals, including the most recent in 2018, breaking a 15 year drought. Students have an opportunity each Tuesday and Thursday to run off some steam at ‘Boulder Athletics’. Students are encouraged to get moving by running laps of the oval or an obstacle course. They earn faction points which contribute towards the ‘Boulder Beat Trophy’. Parents are also encouraged to join in. The action starts at 8am and finishes at 8.30am.